Discussion in 'Gigabyte' started by Hidden, Dec 13, 2013.
they come with different connectors. (Desktop) Boards have two power connectors. of current, it doesn't have to be plugged in. here, if you have a question. You can plug a 20 into a 24. You can plug a 24 into a 20.
and it detaches to handle either kind of motherboard. A 20+4 can handle a 20 or a 24 motherboard. 1) You're using one PCI Express video card only. A 6600 video card draws 4 amps from +12V on the main connector. of a 20 pin PSU. main connector. Now you really need a 20+4 or 24 PSU. 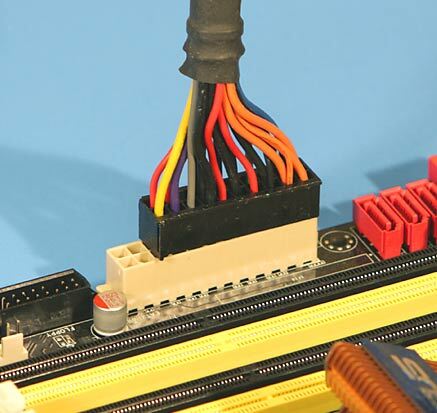 of the connector, latches with the mate on the motherboard. That helps you at least get the right sides lined up. right. Like the other connector, mate the latches. starts to eject itself, the pins get burned. 2x4, can detach. It can make two 2x2 connectors. PSU outputs, and make a bloody mess (burned stuff). processor, overclocked to 4GHz, that draws 200W. connector is seldom needed to be completely filled. that sticker covering the other pins, can stay there. I missed, with a few different words. Paul thanks for the detailed response.